For the love of Bruce! We are sitting with the ladies, the kettle is on, the tunes are playing in the background, and the bush turkeys and wallabies are milling around. We woke with the sunrise, meditated under a tree and have had an early morning nudie swim in the rock pools. Today is an auspicious day – it’s the midwinter solstice, Jani for Latvians, Pee on the Earth day and the day before we take our “big left”. Yes, tomorrow we turn left and start the desert leg of our journey! So grab yourselves a cuppa, a beer or a glass of wine, and I’ll fill you in on the adventures of the last two weeks. They have been a lovely mix of long days in the saddle and rest days exploring beautiful places. We left Gladstone and the positive energy of Matt from A1 cycles, and crossed into heavy industry and noisy transport. We have learnt to block out the noise and drivers by listening to music or podcasts while doing the ks. I’m learning about the amazing world of permaculture and Jude is getting better acquainted with world history. A cheeky wine to celebrate our anniversary. We stopped for the night at the Raglan Tavern and celebrated our 3 and a half year anniversary with a pub meal and a bottle of wine. The wine (and some earplugs) helped with our sleeping, as we were camped about 15m from the Bruce Hwy and 30m from the railway line. 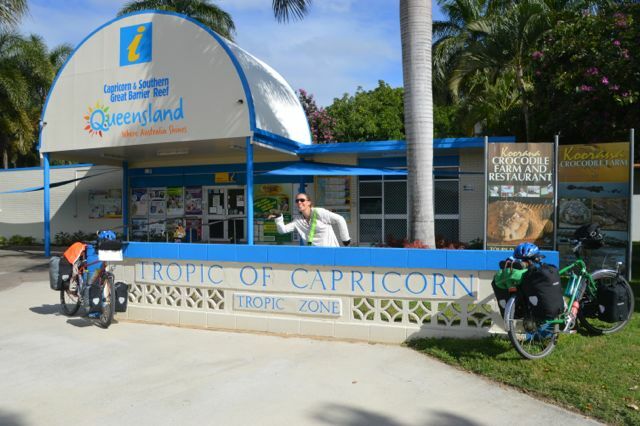 The next morning we crossed the Tropic of Capricorn and covered the 55ks to Rockhampton in record time. We lunched in the botanical gardens and then had a look around town. Everyone had told us that Rocky was a hole not worth visiting, but we found it to be a beautiful town with stunning old buildings and a friendly vibe. We also loved the random cow statues and that it was a public holiday due to the Rockhampton show. It’s amazing what Australians will give themselves a public holiday for. Crossing the Tropic of Capricorn. 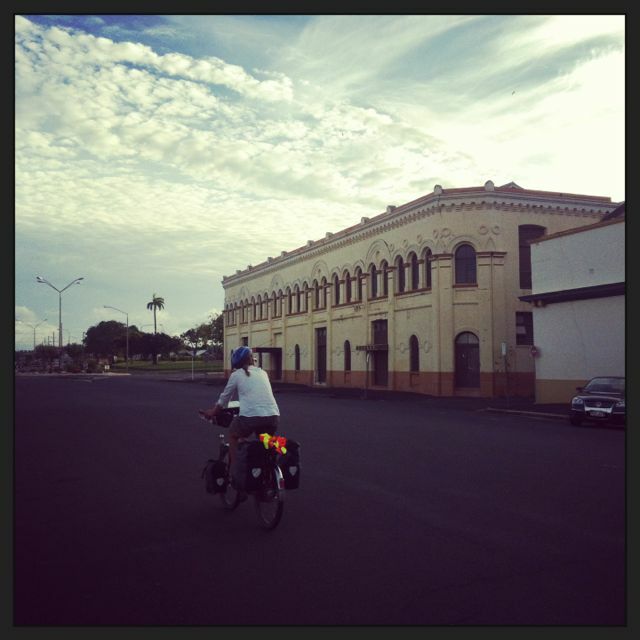 Riding passed the beautiful old buildings of Rockhampton. 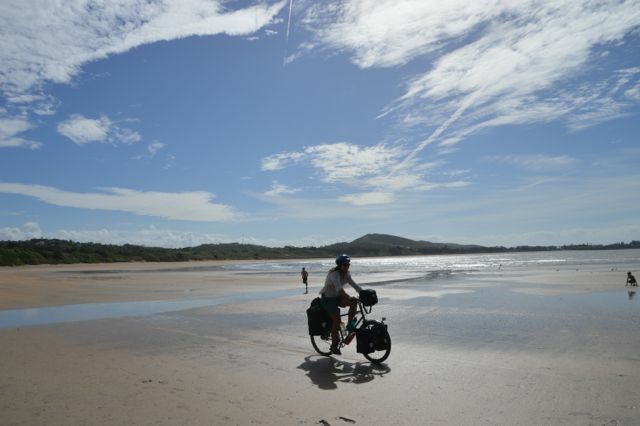 We also deserved a public holiday from the bikes, so we continued on to the beachside town of Yeppoon. Turned out to be not really our kind of place, but we spent a couple of days eating, reading, swimming at the beach, and sharing wine and great conversation with new friends Ann and Tibor. We circled back to Rocky along the coast road, taking in the stunning ocean views, swimming at the beaches and eating tubs of ice-cream in one sitting. It’s amazing the things that you can eat when you cycle for 6 hours a day! Back in Rocky we explored the local art gallery, hung out at the library (to use their free WiFi) and had a beer at the gorgeous Criterion hotel. 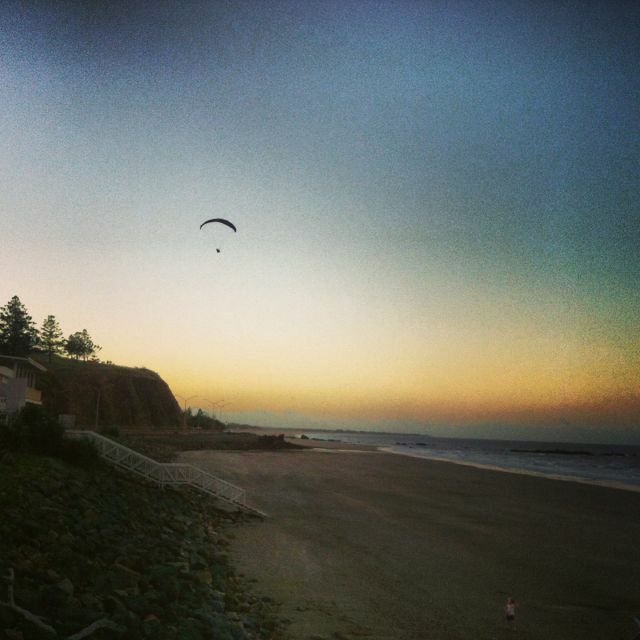 Going for a ride on the beach at Emu Park. Yum, a 1litre tub of frozen yoghurt! 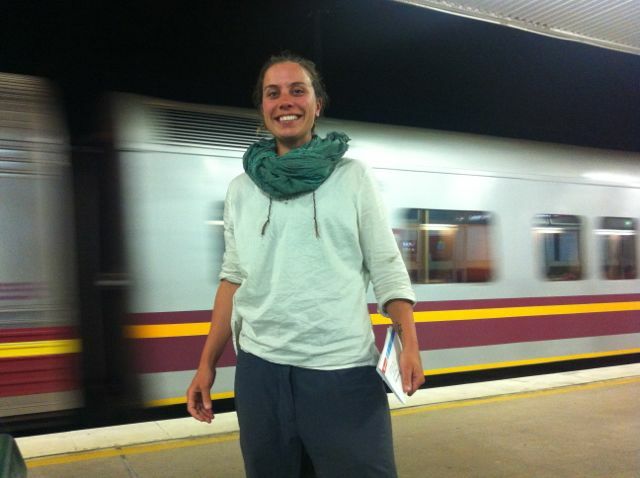 We had decided a few days earlier that we would catch a train from Rocky to Mackay. Not a decision one makes easily when on a quest to ride to Scotland. 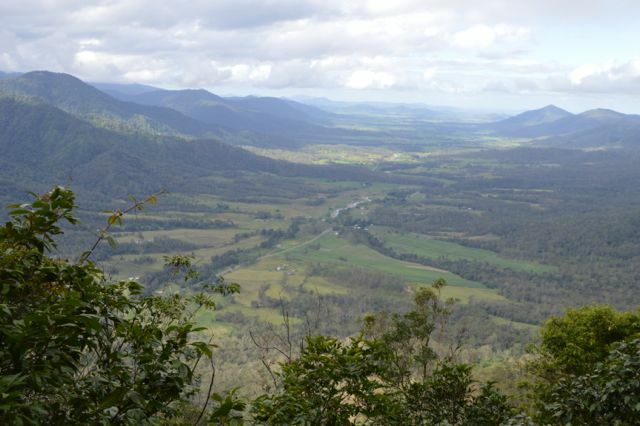 But we wanted to spend more time exploring nicer places in Queensland rather than pushing out the ks on the Bruce Hwy. In addition, everything that we had read and heard from cyclists and drivers, indicated that this is the worst stretch of the Bruce Hwy by far. The alternative route was desolate, full of ghost towns, memories of backpacker murders and road trains. Neither option seemed appealing. So much to Jude’s delight, as she loves trains, we spent a few hours heading north faster that we would have on the bikes. Arriving at Mackay at 2am we were tired and in need of more sleep. The station master was a lady with one of those ‘cat’s bum’ faces, and needless to say that when we asked if we could sleep in the corner of the station till sunrise, her mouth puckered even further and a disdainful ‘no’ was directed towards us. Jude is excited by our train trip. It’s a strange feeling riding through a town you don’t know at 2:30 in the morning. 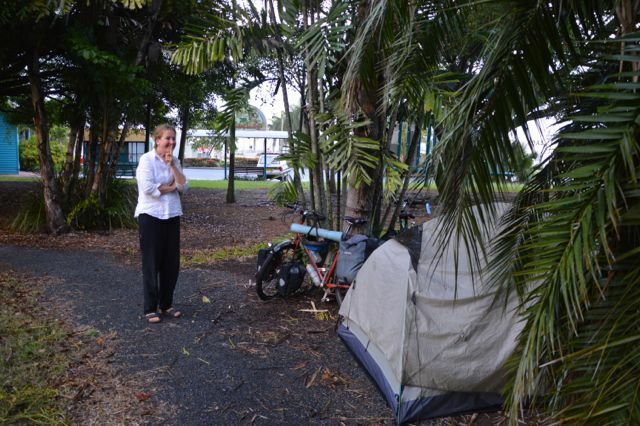 Some stealth camping was performed at the local information centre, and later that morning we explored the town of Mackay. Most places were closed due to the Queens birthday holiday so we headed west along the Pioneer Valley. 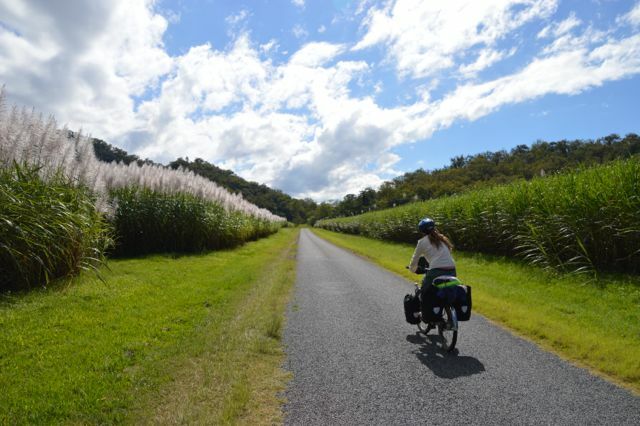 It was a beautiful afternoon of riding through the cane fields and small towns, surrounded by the rivers and mountains further along. 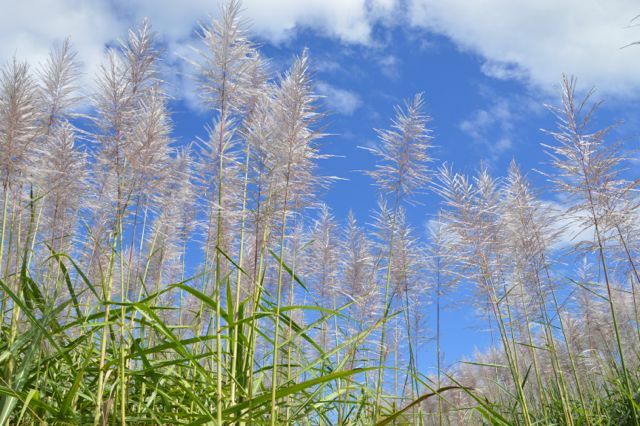 I’m not usually a fan of monocultures, but the cane shining in the afternoon sun was picturesque. The bottom third was a golden colour, the middle third a vivid green and the tops a stunning mauve. 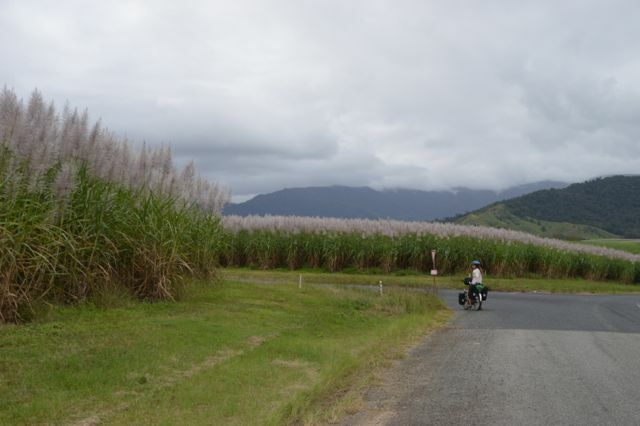 The sugar cane fields on the way to Finch Hatton gorge. 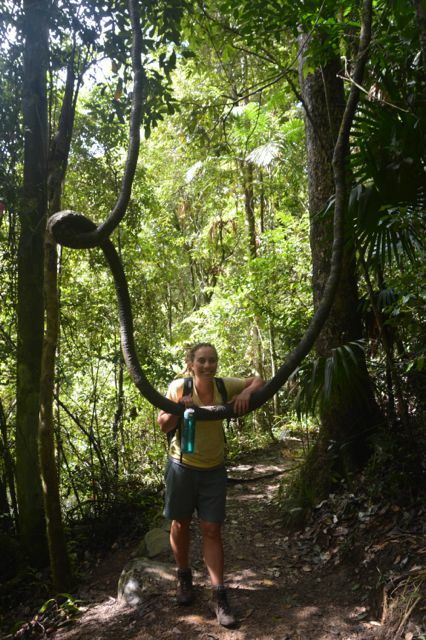 We spent the next couple of nights at the stunning rainforest campground near the Finch Hatton Gorge. 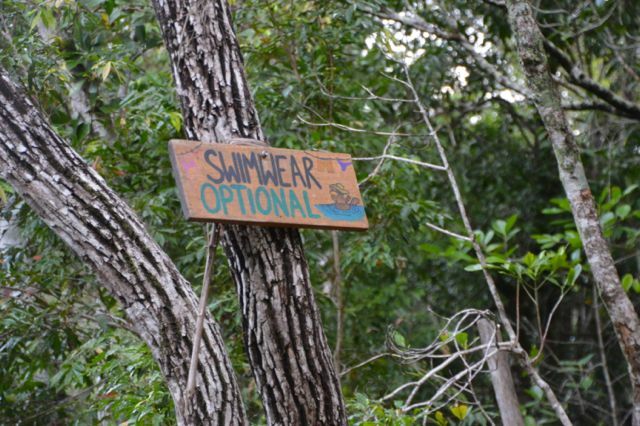 We again spent our days eating, reading, skinny-dipping in the pristine creeks and waterholes (‘clothing optional’ read the sign and we needed no encouragement), exploring the gorge, and enjoying the company of the awesome people camped around us. We had a communal campfire, and when it was raining we sat around in Dave and Eli’s ‘Taj Mahal’ tent with candles and incense burning. 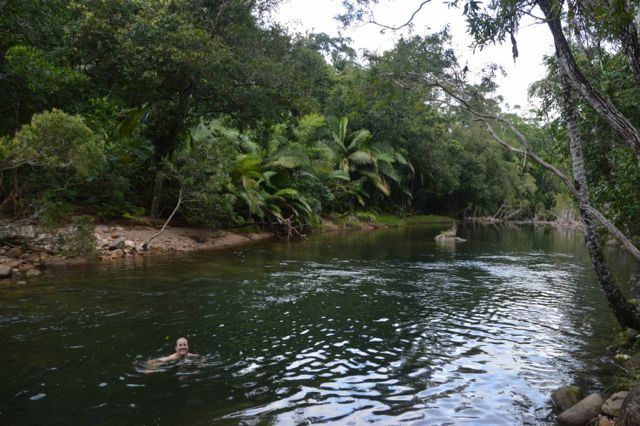 A nudie swim in the beautiful creek. 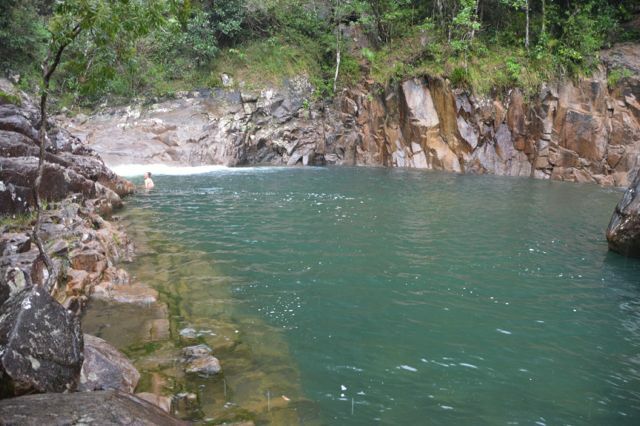 Swimming in the rockpools of Finch Hatton Gorge. 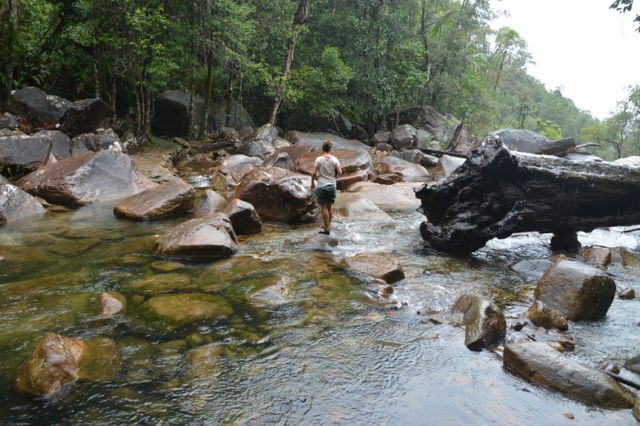 A river crossing at Finch Hatton Gorge. It had drizzled consistently for the last few days, and on the morning we left, the rain really set in. The picturesque landscape of a few days back was transformed into a vision of matt grey. Further up the valley, out of the grey, loomed the warning sign that the next 4.5ks was steep. And steep it was. I remember being sore, soaked through to my undies, and charging on hoping that the top would come sooner rather than later. Since then, we have run into people who drove passed us that day, and all of them commented on how we were powering up the hill, big smiles on our wet faces and seeming to not have a care in the world. 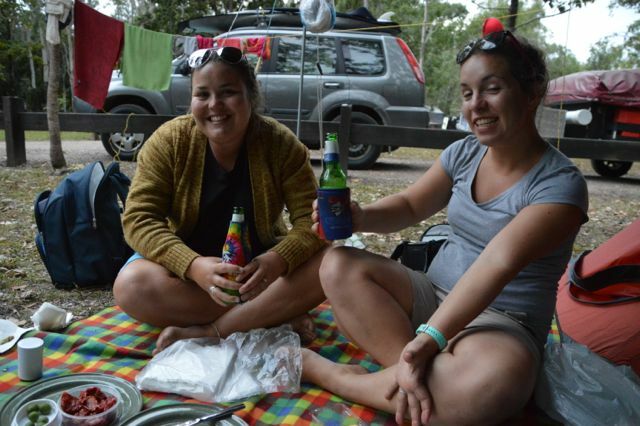 By the time we got to the campsite everything was wet, we cooked our food in the toilet shelter (being the only place out of the rain) and laughed at the way Queensland presents itself. “Sunshine State” – I don’t think so, and the latest “The Smart State” – even less so! 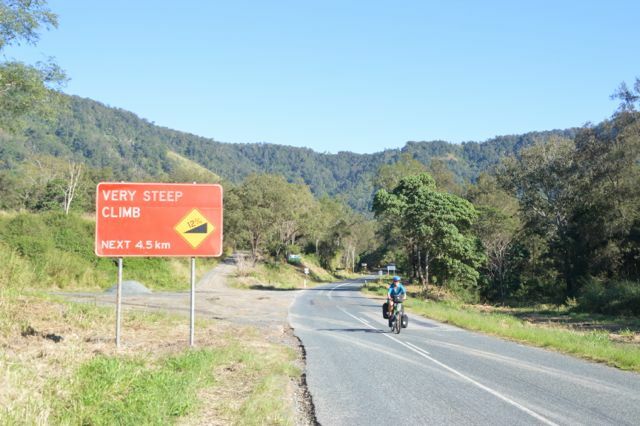 The steep climb sign on the way to Eungella. 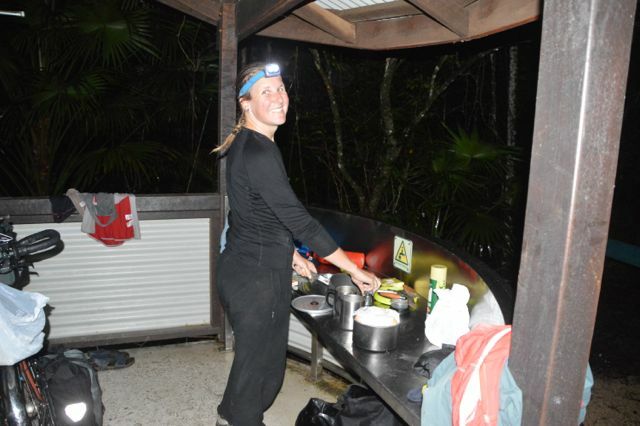 Cooking at the toilet block at the campsite in the rain. It did finally stop raining. We slept in till 7 the next morning and could not believe it when we put our heads outside the tent – blue sky!!! 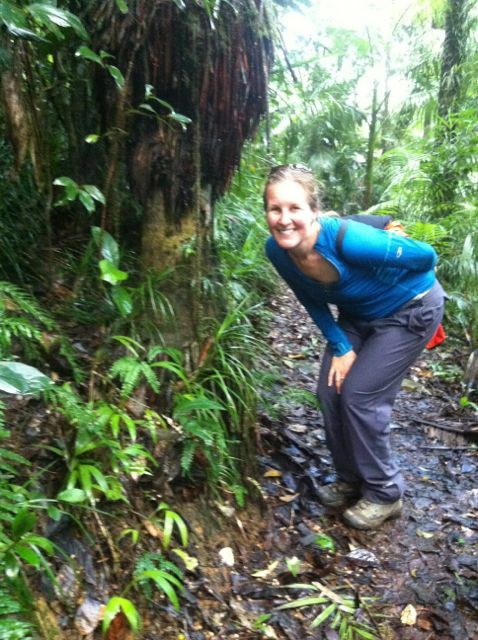 A leisurely breakfast of pancakes and tea, was followed by a 17km hike through the Eungella National Park. We were in greenie heaven! 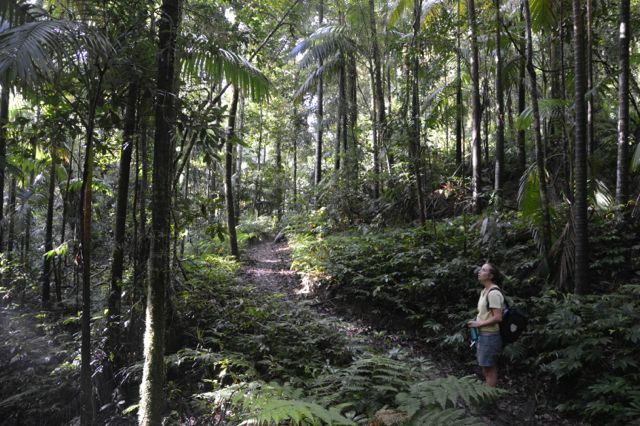 Trees, palms, ferns, fungi, and more shades of green than Derwent could ever release in a pencil colour. From the lookout we could see all the way down the Pioneer Valley and the road we had cycled up. 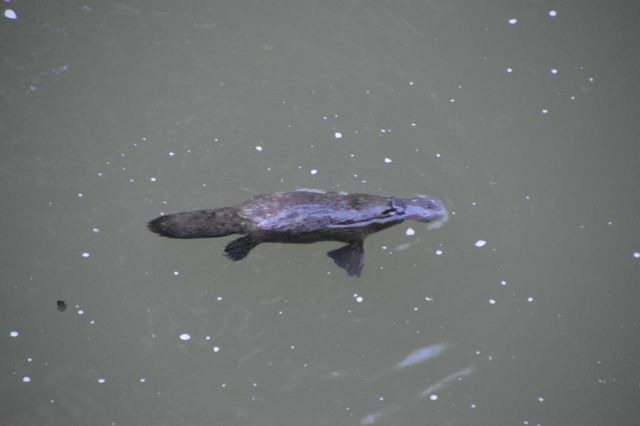 On the way back to our home for the night, we spotted some platypus and turtles in the creek. Awesome! 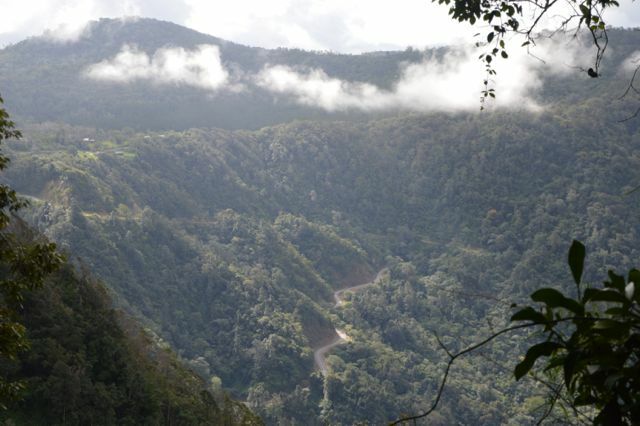 The beautiful Eungella National Park. Looking down the Pioneer Valley. To quote an old saying – what goes up, must come down. The same goes with cycling hills, and it sure was fun!!! We stopped for morning tea at the most gorgeous little café where we indulged ourselves on tasty treats to fuel us for the long ride ahead. 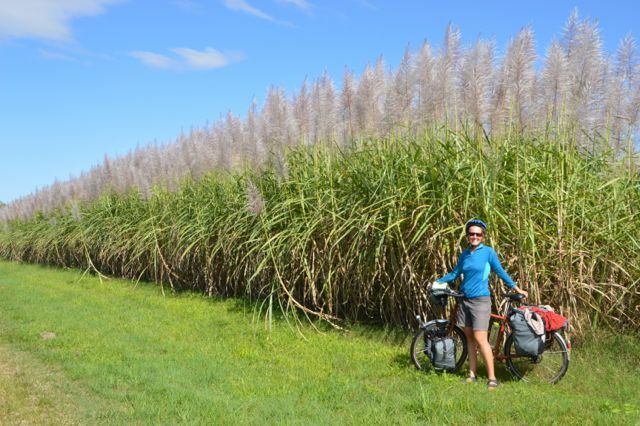 We spent the day riding through more cane fields shining in the sun, and dirt tracks through rainforests. We ate lunch by a cute little creek and had the mandatory nudie swim. 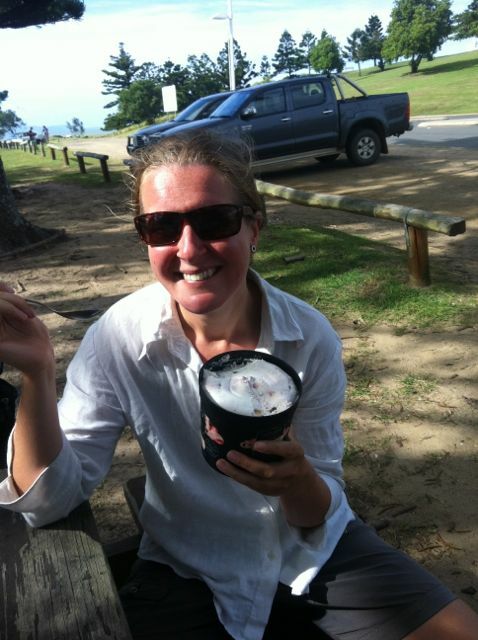 I don’t think the big smile left my face the whole day – by far my favourite day of riding in Queensland so far. The crazy road we pedalled up and flew down. Cane, cane and more cane. Woke the next morning happy that we had not been found by the bogans who were driving drunk through the dirt back roads during the night. Ah Queensland, the smart state. 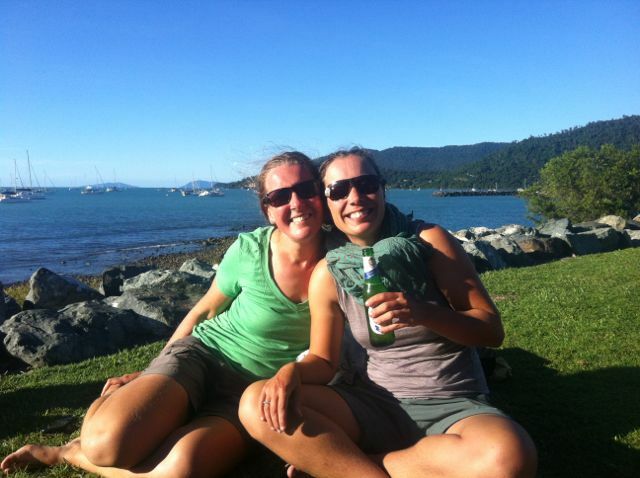 We were also very excited, as today was the day that we would be catching up with friends in Airlie Beach. 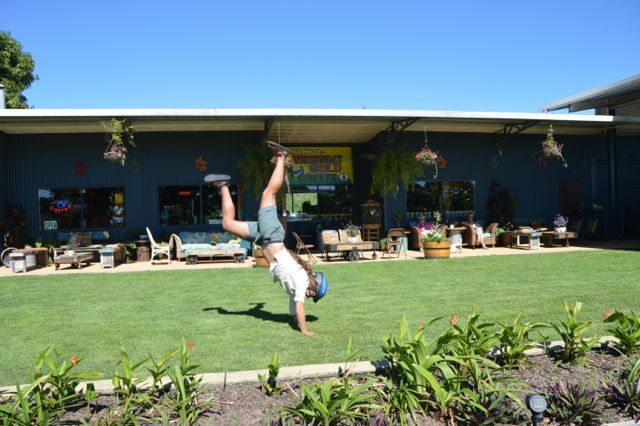 We did a big push to Proserpine and relaxed on the couches of the Whitsunday Gold coffee plantation sipping lattes in the sun. 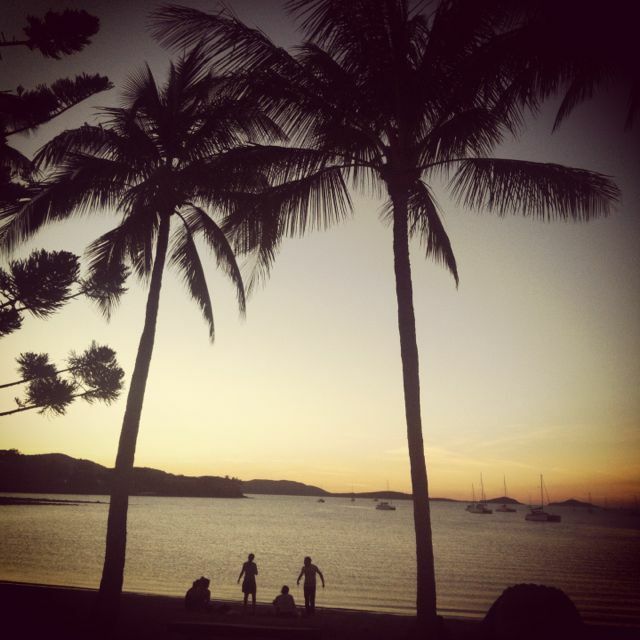 It was difficult to leave and pedal the last 25ks into Airlie, but the catch up with Ash, Soph, Eli and Dave was priceless. 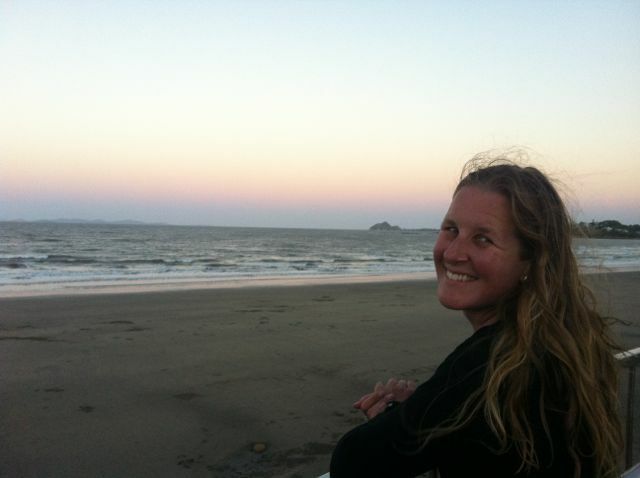 We pitched camp together and then headed down to the beach for some cheeky afternoon beers. 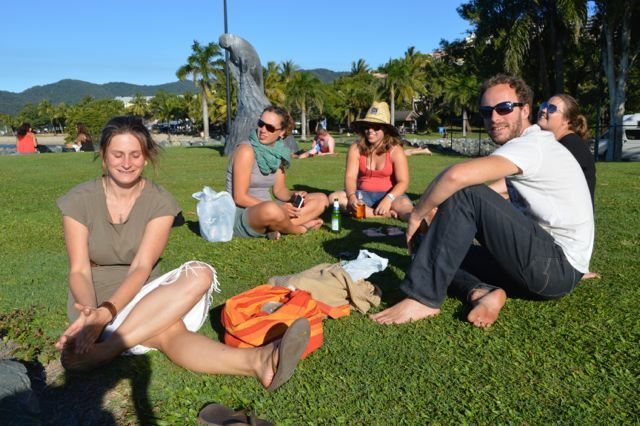 Airlie is a backpacker town, and is really geared towards getting everyone very drunk. I can’t remember the last time I bought a jug of beer for $8, but that set the momentum for the night. Much to our delight we also caught up with Rich and Justin, friends from Melbourne who were in Airlie for the week. 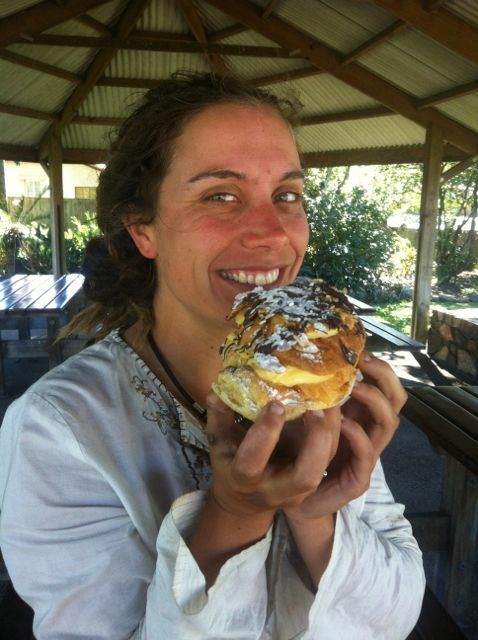 Jude fuelled by coffee and custard cream filled croissant at the Whitsunday Gold coffee plantation. Beers at the beach with Eli, Soph, Dave and Ash. Part of the fuelling process – a big custard cream croissant! The next day was a day of sloth. We spent the morning drinking cups of tea and reading. The most strenuous thing we did all day, was go to the beach and have a barbeque. Jude and I are currently reading books about sea-faring, so we bought a bottle of rum and pretended that we were pirates. Unfortunately we couldn’t find a parrot. Cold Rock also made another appearance, with a group of us sharing a big tub with 5 flavours of ice-cream and 4 treats smashed into it. It’s amazing how addicted I have become to the riding. By the next day I was feeling ansty about being off the bike, so while the others drove to the local waterfalls, Eli and I cycled the 60 plus k round trip. The falls were beautiful and the water very refreshing (read cold!). Eli did an awesome job of cycling, as she hasn’t been on a bike in years. And despite wanting to get off often and just lie down, she is now considering joining us for the Asia leg of our journey. We spent a wonderful evening catching up with Rich, Justin and Nic, and being around people from home made us very happy, but also nostalgic for all our friends at home. You are all loved and missed very much every day! 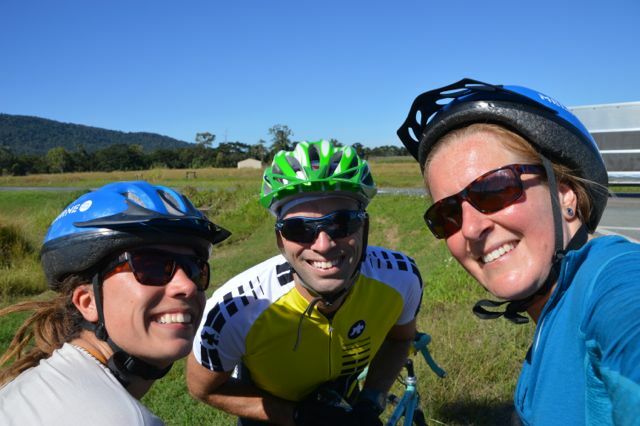 Rich joined us for the ride out to the Bruce Hwy. To make it to Townsville on time to do our ‘big left’, we had to wish all our friends a fond farewell and hit the road again. 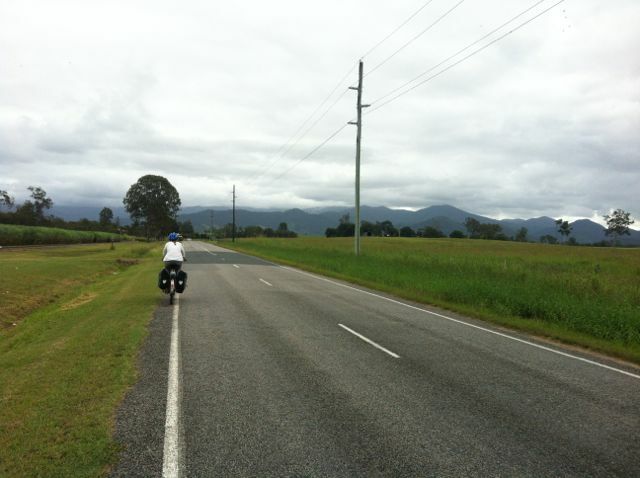 Rich joined us for the ride out to the Bruce Hwy and it was sad to wave goodbye as we headed off towards Bowen. The Big Mango greeted us on arrival in town, and the mango sorbet was so good after a few hours cycling in the heat of the afternoon. We headed to the beach for a dip in the sea and there we met Bob cruising around on his fantastic bike. 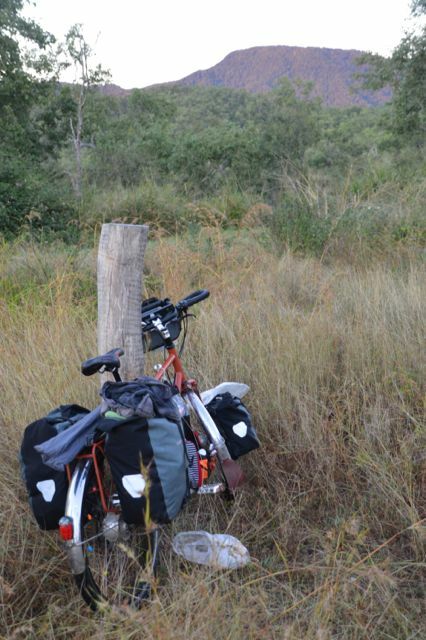 We chatted cycle touring and travel for a while, and then he invited us to stay at his place for the night. We watched the sunset from the lookout just behind his house and spent the evening talking about anything and everything, and looking at all the interesting things he had recently come across on the net. 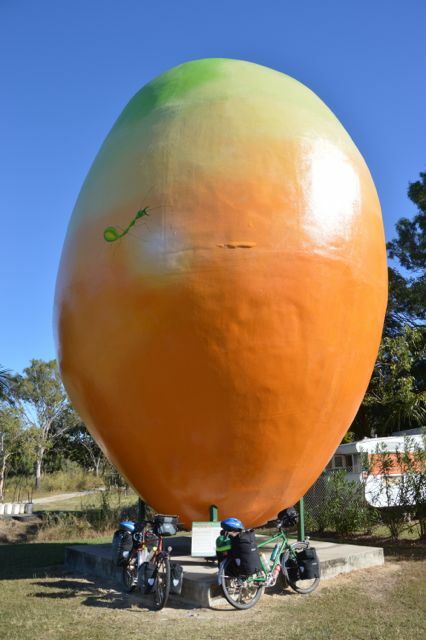 The Big Mango at Bowen. 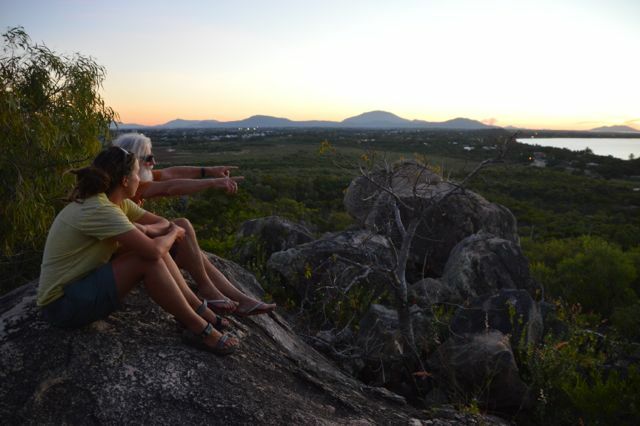 Watching the sunset from the lookout behind Bob’s house. Even with this perfect life, sometimes things go a little pear shaped. It started perfect enough riding through the market and vegetable gardens of the area. We bought a massive bag of tomatoes for $2 from a roadside stall. Then things went a little pear shaped. 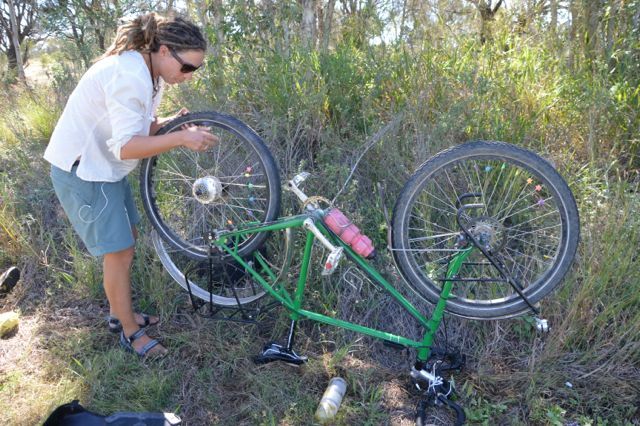 We had our first flat of the trip, not normally a drama, but a 20 minute job turned into an epic two hour episode in the heat of the day. I must give a big thumbs up to our Schwalbe Marathon tyres as they have been awesome considering the distance and terrain we have covered. 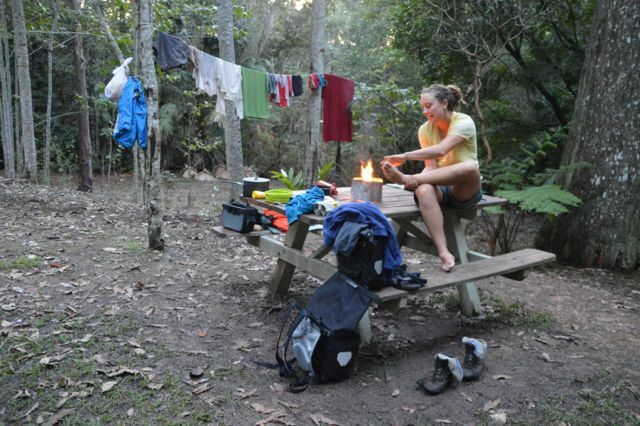 After pushing on to make up the distance we had lost, we camped the night in a rubbish infested road stop right next to the Bruce Hwy. Finally, the throat infection I had woken with, ended up becoming a crazy chest infection. Our first flat of the journey. The fruit stall where we were loaded up with melons. But the morning dawned in sublime hues of red, pink, orange and purple, and we pedaled off to complete our first 100km day of the trip. 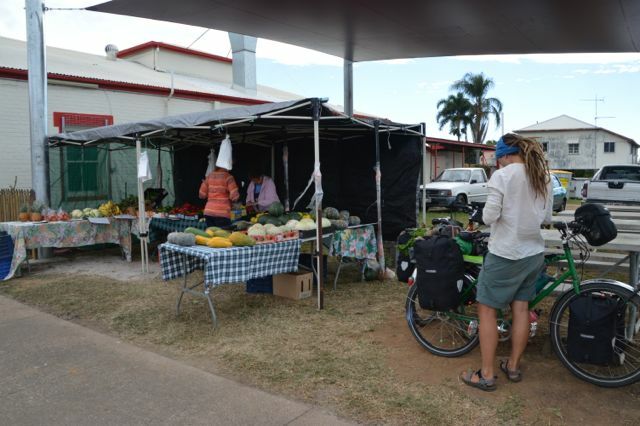 A roadside fruit stall in Home Hill had us eating fantastic rockmelon, and the owner Alan, would have had us carting five varieties of other melons on the back of our bikes, if his lovely wife Francis had not intervened after the first two were gifted. 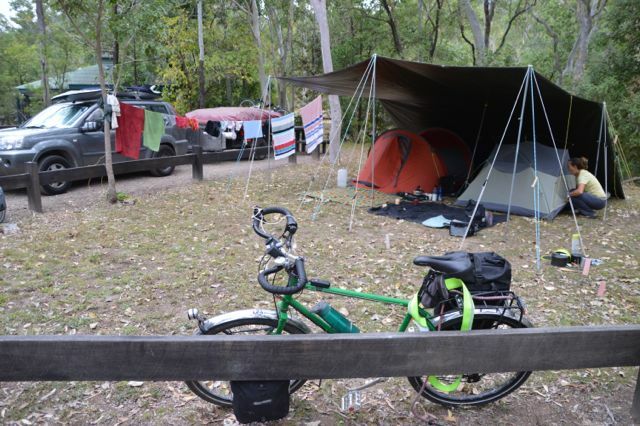 After a few hours riding we were very excited when the turn off for Alligator Creek came into view, and were even more excited when we spotted Ash and Soph in the campground. 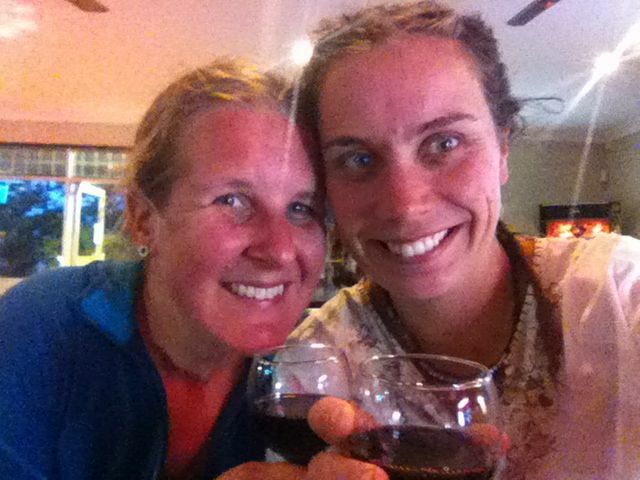 We had done it – our first 100km day! We celebrated with a swim in the rock pools and waterfalls, and I found myself a lovely lady spa to relax in. All was wonderful, until on our return we discovered that the bush turkeys had massacred one of the melons we had carted for the last 80ks. Not happy turkeys! But a BBQ and music by candlelight had our night ending perfectly. 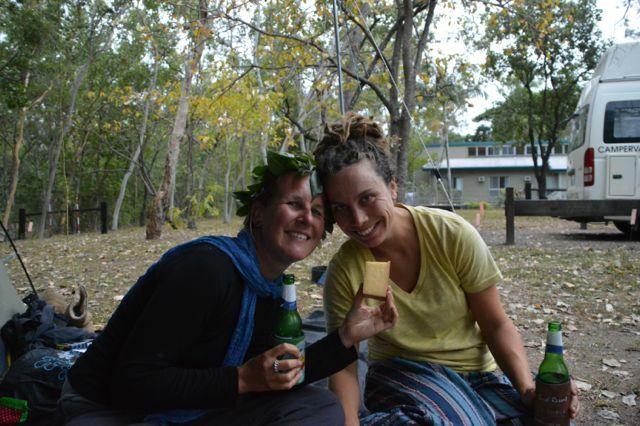 Our camp at Alligator Creek. So as you finish up your cuppa, beer or wine, time has passed here as well. We area about to kick off our Jani celebration – we have beer, cheese, vainags (wreaths made of leaves and flowers worn on our heads), Latvian tunes, a guitar and four voices to celebrate this amazing day! Ligo! All my love as always, Astrid. Ash and Soph celebrate Jani with style.